Sukkot ends: The rites and meals are over, but the gates never close – J. Each day during Sukkot, the Contemporary Jewish Museum invited museumgoers into a barebones, wood-frame sukkah in the museum lobby. No admission required! 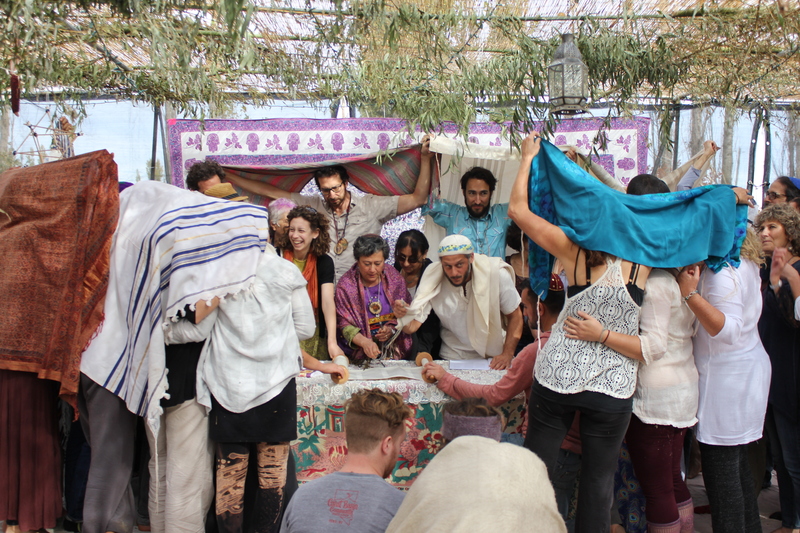 The day I stopped by, photographer Ari Salomon was in the sukkah with his stunning panorama photography, showing others how to get in on the fun with their phones. He brought his large-format printer, a huge machine that was more desk than desktop. After taking their own panoramas in front of the building or in the lobby or wherever, museumgoers were to email their picture to Salomon, who would then print it out right then and there. Hanging in the sukkah were Salomon’s long, twisting panoramas of urban settings. His work is evocative of Sukkot in the way it bends reality around the viewer. To enter a sukkah is to have the world warped around you in a new way. The sukkah reorients us by wrapping us up in the embrace of something temporary but still comforting; we are inside, but the outside remains visible and tangible. I love the lobby of CJM. It’s a long, slender, tall space, topped with an intricate overhead piece of art, “Lamp of the Covenant,” that stretches the length of the ceiling. On what appear to be moving tracks (but not really) is a series of globes, planets, heavenly bodies and light bulbs of many shapes. I find myself staring up and admiring this piece whenever I’m there. But this time, I had Salomon to help me see it in a new way. With my phone I made a panorama of the sprawling piece of art above. As an aside, Salomon also related his work to shaking the lulav, a Sukkot ritual that orients us in space by shaking the arba minim in six cardinal directions. I quite like that. 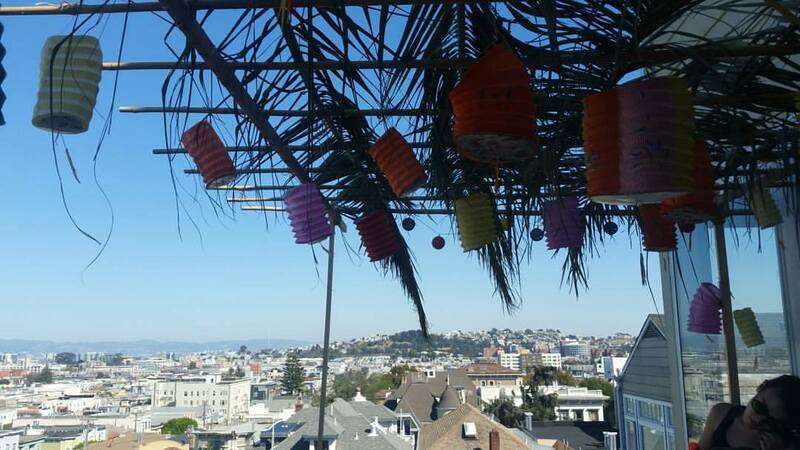 Cantor David Frommer of Congregation Sherith Israel in San Francisco invited me over for dinner in his family’s lovely sukkah. We were joined by my good friend and frequent Jew in the Pew companion, professor Rachel Gross of the S.F. State Department of Jewish Studies, as well as a few others. 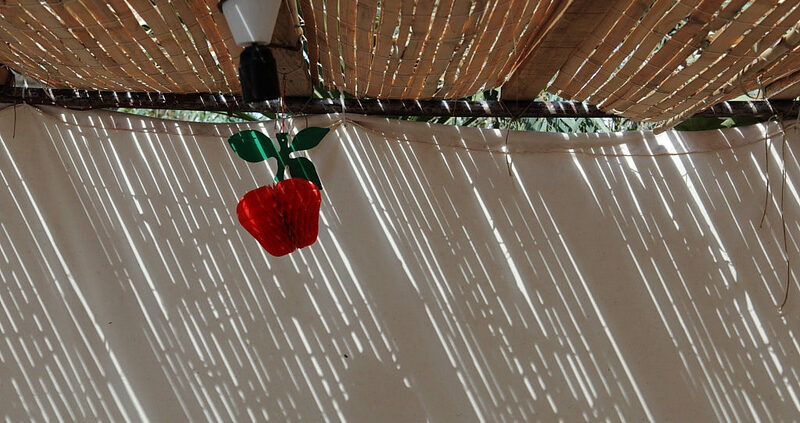 The best thing about Frommer’s sukkah was the array of photos of other sukkahs displayed all around the walls. Some were pictures of previous family sukkahs, but several were from Frommer’s alternate life as a chaplain with the Army National Guard. In varying conditions and with truly makeshift materials, he has built multiple sukkahs on Army bases. 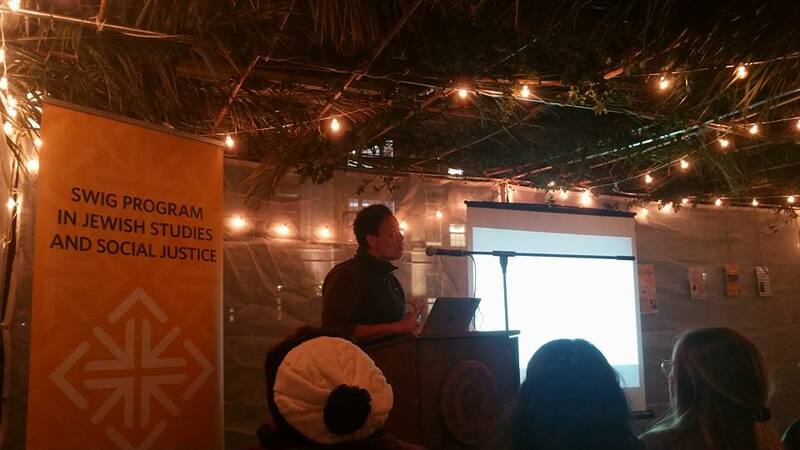 One photo showed a completely kosher sukkah built entirely out of folding tables! I imagine Sukkot’s theme of shelter hits particularly close to home when you’re living on an Army base, especially so in an active theater of combat. I meant to follow up with him later to get more details, but he has since been called up by the National Guard to serve with soldiers assisting in the fight against the Northern California wildfires. Sukkot knows what game it’s playing. After a week jam-packed with the strangest rituals of the Jewish year, on its final morning, Sukkot drops Hoshana Rabba on us. It is nuts. It is wonderful. It is the most fun you can have in shul without getting drunk and booing Haman. And if you don’t let your kids skip school to go Hoshana Rabba, you may need to rethink that. At most synagogues, you either bring your own lulav and etrog or you miss out on the fun. But Beth Sholom had a big basket of them for all to use, though at this point in the holiday they were looking a lot worse for the wear. About 20 people were present, and it was a joy to see everyone marching in circles around the room (but I’m getting ahead of myself). Rabbi Aubrey Glazer expounded on the proper way to hold a lulav. While most people have a great time shaking it up and down noisily in each direction, Glazer advises a more gentle, circular motion, as if drawing water up from the ground. I have always thought the shaking sounds like rain, making the lulav a rain stick. Hoshana Rabba, like much of Sukkot, is about beseeching God for a year of good rains, so either approach is on-theme. Spotted in the back of a pew at Congregation Beth Sholom during Hoshana Rabba: the current issue of J. 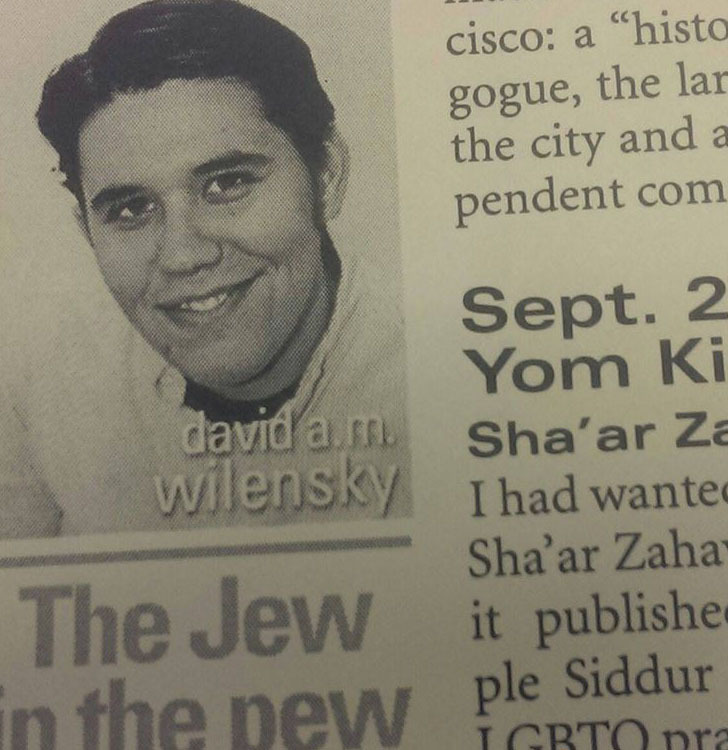 Please note: J. is not rabbinically approved davening material. But the stars of the show on Hoshana Rabba are the hoshanot, seven slow and steady circuits around the room the singing and shaking the lulav while making as the leader intones prescribed text, all of this punctuated by the group’s exclamations of “hoshia!” (God delivers). Some, like myself, attempted to follow along in our siddurs at the same time. Not easy. You try holding all four species and reading a prayerbook while walking in circles and singing and proclaiming. Precariousness, thy name is Hoshana Rabba. Meanwhile, a powerfully voiced fellow’s shouts of “hoshia!” were so loud and startling that my friend Jill jumped every time. What a sight this ritual is! Hoshana Rabba concludes with everyone removing the willow branch from the lulav and whacking it on the ground and furniture. 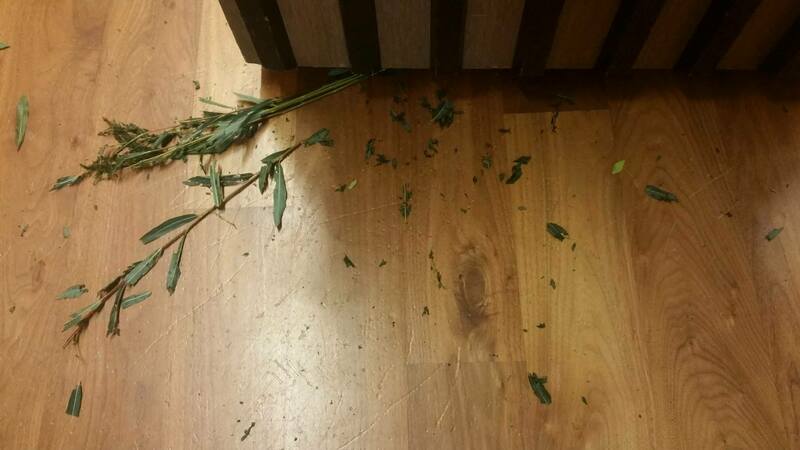 If your shul is well prepared, like Beth Sholom was, it will have an extra supply of willow branches to supplement your bundle — more foliage means more satisfying thrashing. Glazer thrashed his on the side of the podium with such vigor that it left green stains. After the thrashing, all were invited to toss their spent willow branches on top of the ark, terrific family fun for all ages. So why do Jews do this? One reason, a congregant suggested, is that finally, after all these holidays, the season of repentance truly closes at the end of Sukkot; perhaps in shaking all these leaves from their branches, we are doing a kind of last-ditch tashlich, hacking away those last few hard-to-remove bits of sin that remain after a long season of atonement. Is this really our last shot at repentance for the year? During Neilah, at the end of Yom Kippur, we are told that the gates are sealed, that our chance at repentance is ended. Then we’re told Hoshana Rabba is our last chance. But, Glazer told us, the truth is that the gates are never really closed.